Marina Mariola is as good a location as you can possibly find in Marbella. 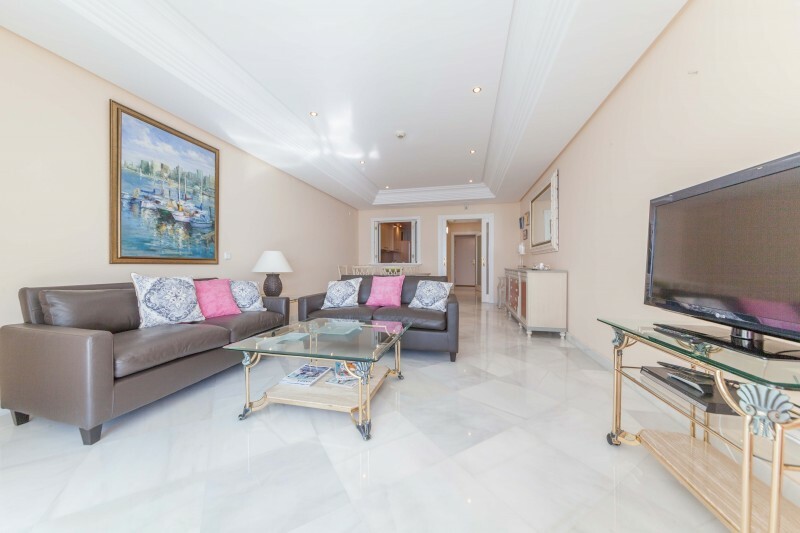 This landmark building situated adjacent to the Don Pepe Hotel and Cappuccino Restaurant is right on the beach and just a short walk from all the amenities of Marbella Town. From here the choice of restaurants and shopping is second to none and the views are completely beyond compare. From the terrace of this 2 bedroom, 2 bathroom apartment you can look over the pool, the beach and Mediterranean Sea towards Africa and Gibraltar. Marina Mariola is one of the last buildings to be built on the Paseo Maritimo and has a distinctive architectural style. There is 24 hour security and, in addition to the two pools and gymnasium, manicured internal gardens add to the feeling of unashamed luxury. The apartment is well presented with 2 bedrooms and 2 bathrooms with a well fitted kitchen. A garage parking space and store room are included in the sale. The asking price is 1,295,000 Euros. If you would like more details or an appointment to view please give us a call on (0034) 952 90 52 00 or click the Request Information button below.